WASHINGTON — President Donald Trump spoke at the U.S.-Mexico border in Californai on Friday, warning that "our country is full" and cannot accommodate any more immigrants. "The system is full. We can't take you anymore," Trump said at a roundtable event on Friday with law enforcement officials and local leaders at a border patrol station in Calexico. "Our country is full...Turn around." 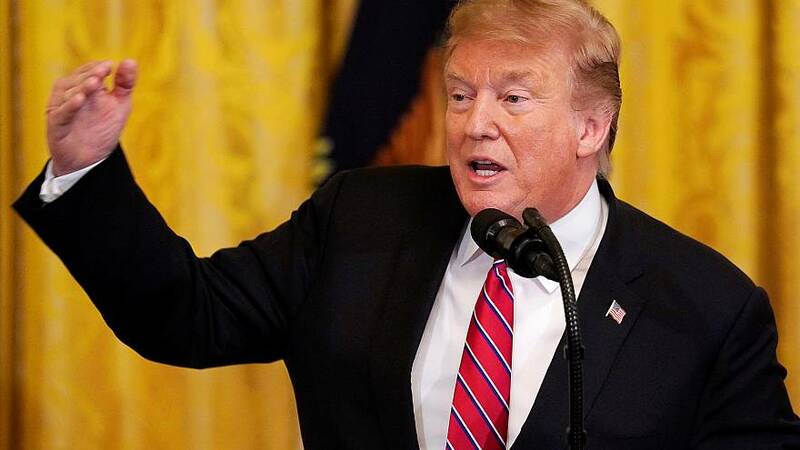 Trump also reiterated his willingness to impose an auto tariffs on Mexico or closed the border if the flow of migrants at the southern border does not decrease. However, the president expressed hope that he would not need to do so and thanked Mexico for doing more in the last four days "than they have ever done" to stem the number of people reaching the border. "They're apprehending people now by the thousands and bringing them back to their countries, bringing them back to where they came from," Trump said of Mexico. Trump also stated that he plans to make significant progress on the border wall construction in the next two years. "We expect to have close to 400 miles done within about two years from now. That's a lot — 400 miles will cover most of it," he said at the roundtable meeting, promising that a barrier along the border would deliver results. "What we've done and what we're doing, you're gonna see some very, very strong results and as soon as the barriers or the walls — I like calling them walls 'cause that's what they are — go up, you're gonna have a tremendous impact." Trump is expected to visit the southern border wall in California later Friday.